Forget the lifeless Left – we want revolution! 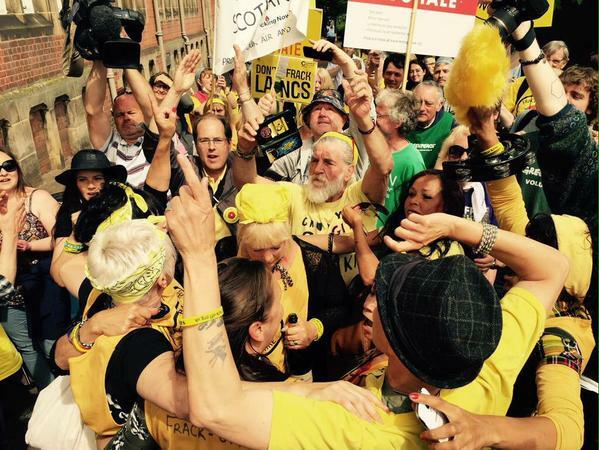 A significant battle in the war against fracking was won by campaigners in northern England on Monday June 29. Lancashire County Council rejected the second of two applications from Cuadrilla for large-scale fracking in the county in a decision that shocked the fracking business mafia. Cuadrilla had hoped to drill four wells and undertake exploratory fracking for shale gas at Little Plumpton on the Fylde. Share prices for fracking firms plummeted after the historic decision – it is now clearer than ever that there is a deep-seated and determined opposition across England to the frackers’ environmentally disastrous plans. Greenpeace described Monday’s outcome as “a Waterloo for the fracking industry”. John Williams of Poyry Management Consulting told the Daily Telegraph: “This decision is a serious setback for shale gas in the UK and many must be wondering if it can ever reach production phase”. Although the planning committee had already turned down Cuadrilla’s proposal for Roseacre Farm between Preston and Blackpool, it had looked as if councillors might be bullied into approving the Preston New Road scheme. They were given controversial legal advice suggesting it would be against the law to turn it down and reported feeling under intense pressure. But in the end they voted against their officers’ recommendation to accept the bid and they also rejected a Cuadrilla application for seismic monitoring because “the cumulative effect of the proposal would lead to the industrialisation of the countryside and adversely affect the landscape character”. 2. Forget the lifeless Left – we want revolution! We live at a moment when the future not just of the human race, but of the planet is at risk. 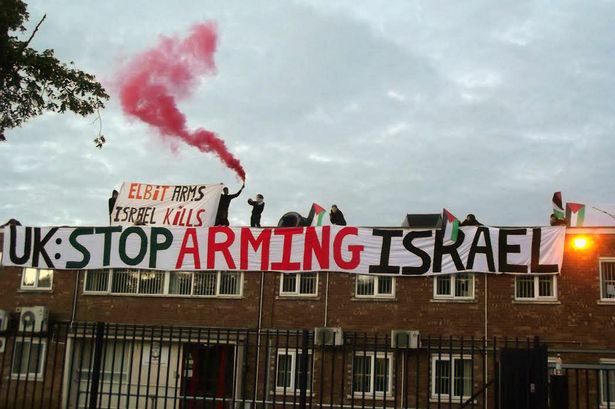 The cancer of industrial capitalism, with its secondary tumours of militarism, imperialism and repression, is choking us all to death. We need to rise up and cast off this disease, get off our knees and rediscover our collective inner strength and health. But where is that inspiration going to come from? 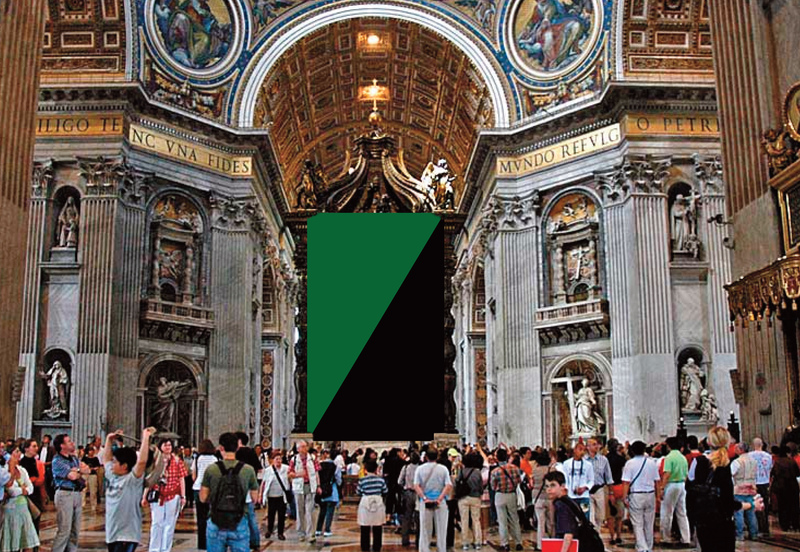 What is the banner behind which we can gather in order to wage philosophical and practical war on the system that is killing us all? 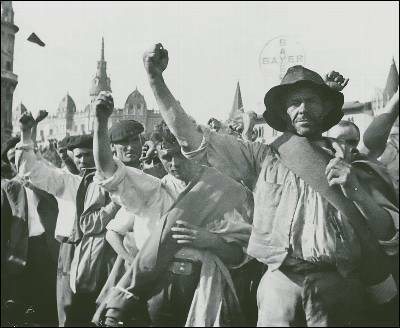 For the last couple of centuries the answer has been assumed to have something to do with the Left – the idea of a loose but nevertheless coherent body of thought and practice which stands in opposition to capitalism and its world. But increasingly that answer is looking to be the wrong one and the lifeless Left is showing itself to be another aspect of the capitalist system, rather than something that challenges its existence. As the leftists of the UK trade union movement sell out to the fracking industry (see below) and their reformist-left comrades in the UK “anti-austerity” movement continue their glorious struggle for a Nicer Kind of Capitalism (see here), a yawning void is appearing at the spot where there ought to be a resistance movement against the whole capitalist system. The wretched failure of the Left to oppose industrial capitalism is so complete that by comparison the Roman Catholic Church is now looking positively radical (see here)! We need to break out of the reformist strait jacket that “left-wing” thinking has put us in. We need to throw off the blinkers of its restrictions and inhibitions and look clearly and boldly into the eyes of the industrial-militarist-capitalist beast before thrusting a stake through its putrid heart. The sickening pro-fracking stance of a British trade union is a useful reminder of how the “Left” has historically failed to fight industrial capitalism. 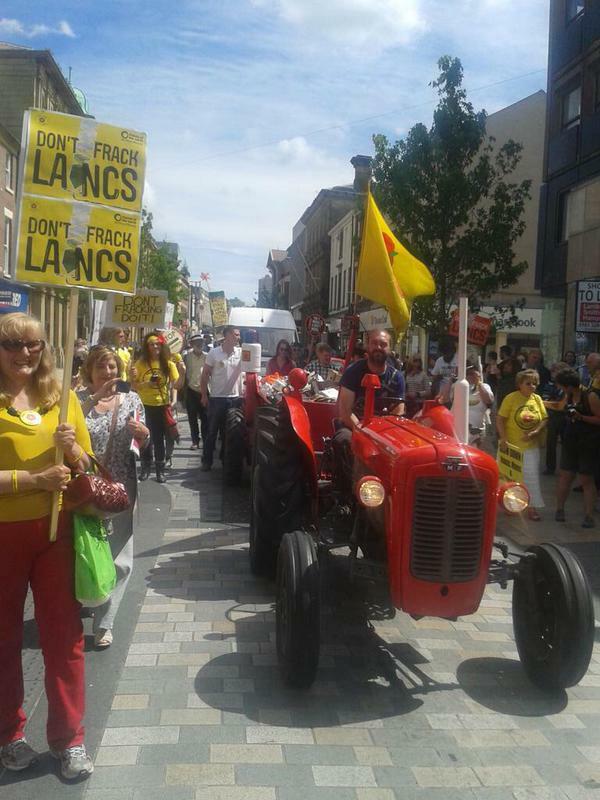 While people power in Lancashire was persuading the council to throw out fracking applications, the GMB was busy cosying up to the industry. 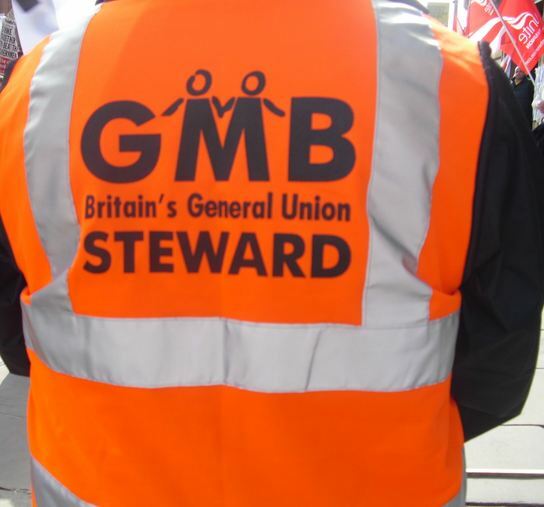 The GMB is a “general” trade union in the UK, affiliated to the TUC and the Labour Party and boasting more than 631,000 members. As it proudly declares on its own website, its Northern Region recently had the bright idea of getting a briefing on the fracking issue. And who did these “leftists” ask? Frack Off perhaps? Friends of the Earth? Nope – they went straight to the Chemical Industry Association, the leading national trade association for the chemical and chemistry-using industries in the United Kingdom. Who cares about pollution if jobs are involved? “Business need”? What sort of language is that for a trade union to adopt? And this is not a one-off. It follows a statement from the GMB Congress on June 8 2015 which says that “while there are important considerations, the economic, indigenous energy and employment benefits cannot be ignored”. The union has even done a deal with UKOOG, the front group representing the fracking industry in the UK. Here we have the heart of the problem that has afflicted the “Left” since back in the 19th century. At heart, it is not actually against the capitalist system, it just has certain minor quibbles with the way it is run. But, of course, these left-capitalists are in denial about all this. They refuse to admit that industrialism and capitalism are essentially the same thing – that you cannot pretend to be against an economic system and yet wholeheartedly support the physical infrastructure that enables that system to maintain and expand its control. They are also apparently incapable of seeing through the capitalist lie that there is something inherently good about “jobs” and are happy to fight for the “right” of their members to spend their lives as slaves to the global industrial greed-monster. Even worse is the hypocrisy surrounding this, which echoes the hypocrisy of the ruling elite with their oxymoronic “sustainable development”. The GMB, like others on the industrial left, seem to think they can claim to be “green” at the same time as cheerfully oiling the very machineries that are killing the planet. The anti-fracking movement will hopefully ensure that from now on the GMB is instead recognised as a corrupt and cowardly collaborator with the business mafia which is destroying our planet for its own profit. 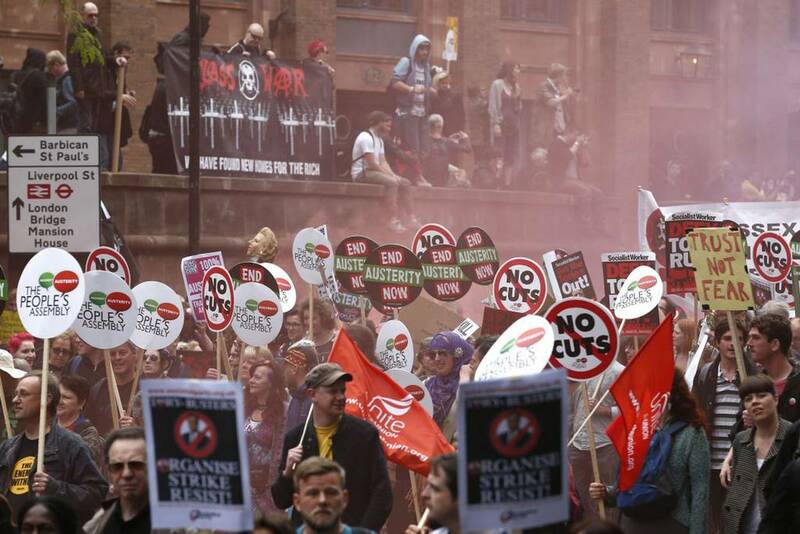 There were several good things about the anti-austerity march in London on Saturday June 20. One of these was the sheer numbers of people out on the streets – 250,000 according to the highest estimate. 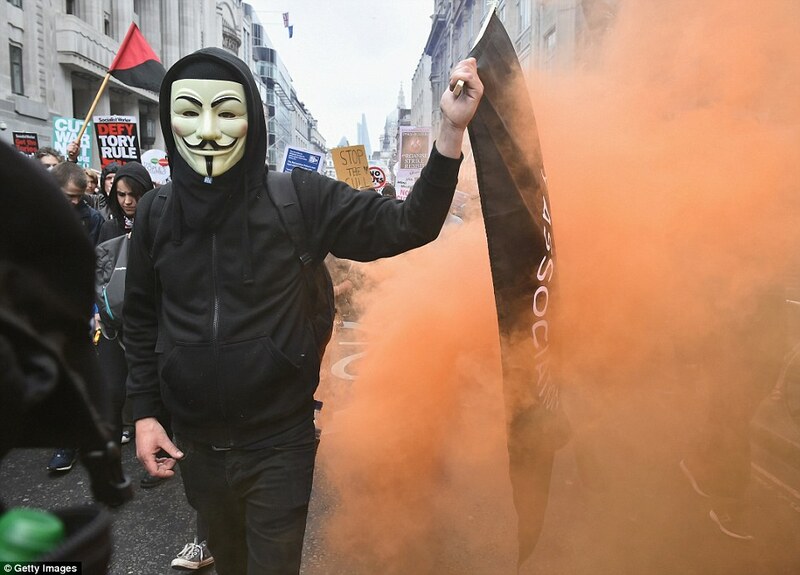 Also encouraging were the visibility of the privacy bloc (handing out free masks), the high-profile presence of Class War and other anarchists, the use of flares and the bonfire of placards at Parliament Square. There was also the breakaway wildcat march that crossed Waterloo Bridge and led to an impromptu blockading of the Elephant and Castle traffic system, as van loads of riot cops moved in. But there were some depressing aspects to the day as well. The official event was always going to be an authorised “A to B” march, but this one at time felt more stage-managed than ever, not least because of the pre-arranged invisibility of police along the route (they were all hiding round the corner or mingling in disguise). There was also something basically wrong about marching from the Bank of England instead of on it. 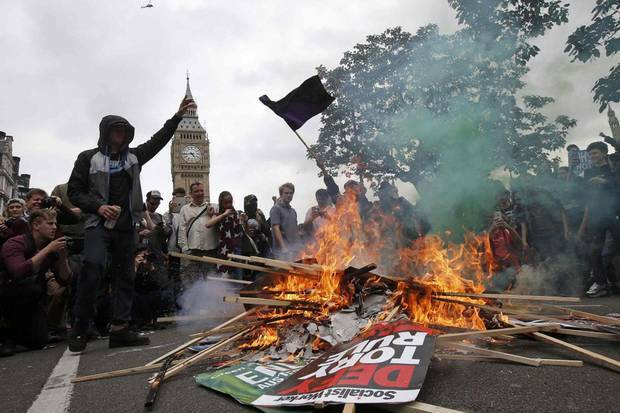 The aim of the event was therefore not to lay siege to a symbol of capitalism but to get to Parliament Square and listen to Russell “#lovethepolice” Brand. And, of course, this was not a very radical collection of citizens, for all their good intent. Many of these were the kind of people who kid themselves that salvation might come from Jeremy Corbyn or wind turbines. A lot of them are against neither the state (which they don’t want to be “cut”) nor even capitalism – just the worst excesses that they see incarnated by “The Tories”. 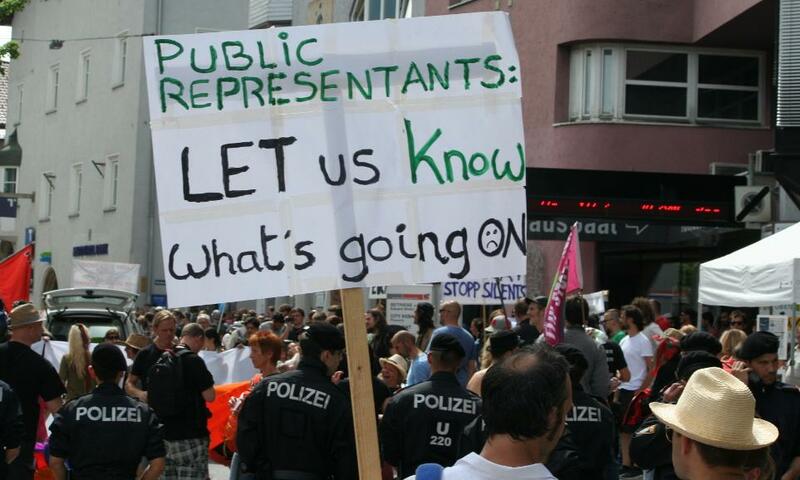 What do they want? 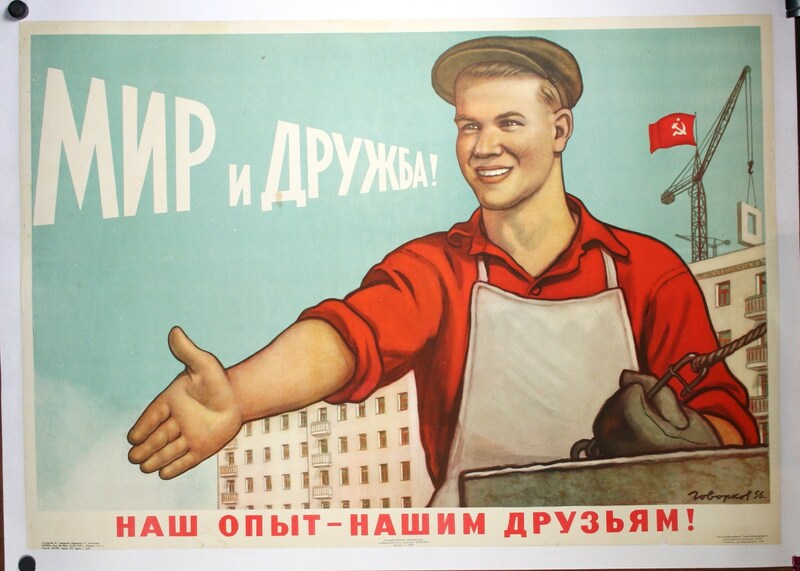 A Nicer Kind of Capitalism! When do they want it? When the police say it’s OK! A million euros of damage was caused in a sabotage attack on a business involved in the Notre-Dame-des-Landes airport project. 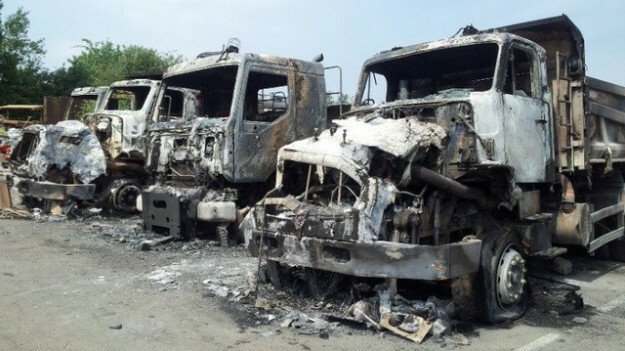 Ten vehicles were destroyed in the fire at Eurovia’s premises near Limoges in central France, apparently started deliberately through placing bottles full of petrol on their wheels. Eurovia is part of Vinci, a notorious international company heavily involved in all kinds of insidious capitalist infrastructure projects, notably motorways and prisons. Most famously, it is Public Enemy Number One of the ZAD protest camp which for many years has been protecting woodland near Nantes targeted for a new and unwanted airport. 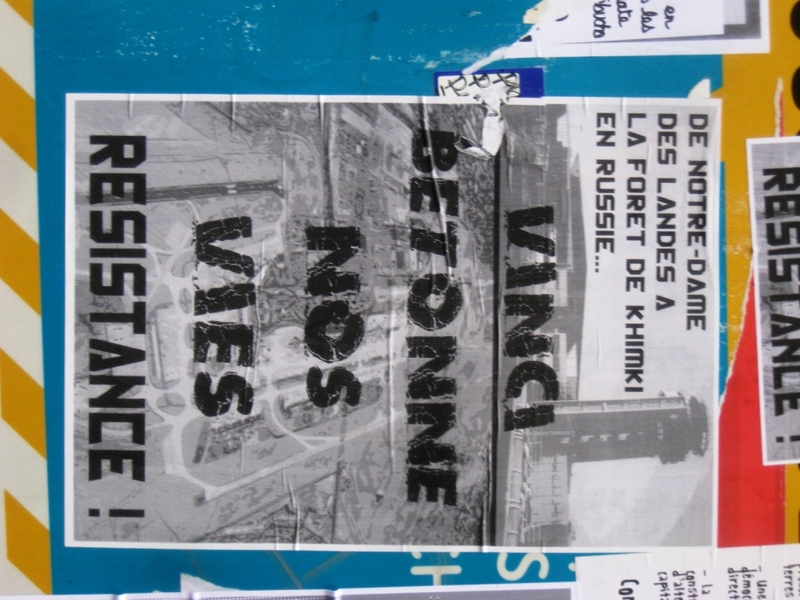 But Vinci has also attracted criticism for its involvement in the equally unnecessary Bexhill-Hastings Link Road in Sussex and the motorway threatening the Khimki Forest in Russia, where opposition was met with brutal oppression. 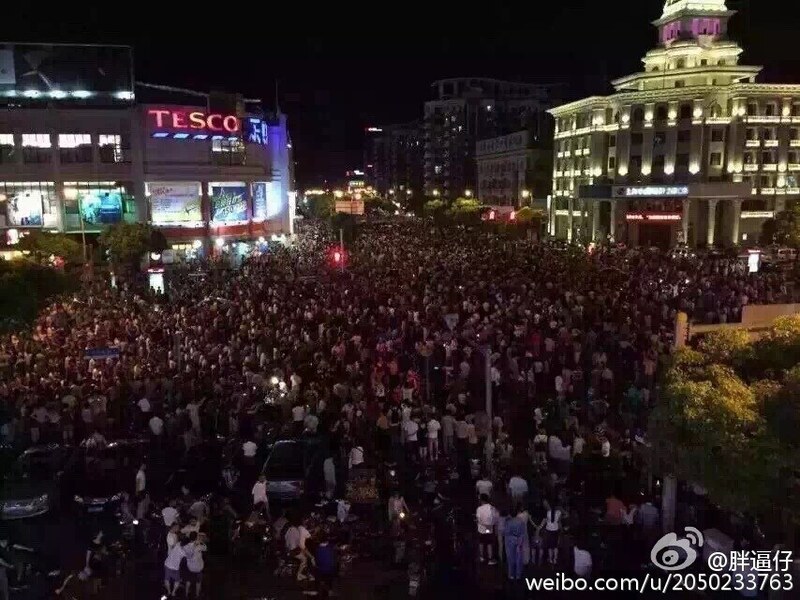 Massive resistance to industrialism continues to spread across China, as thousands of people take to the streets in anger. 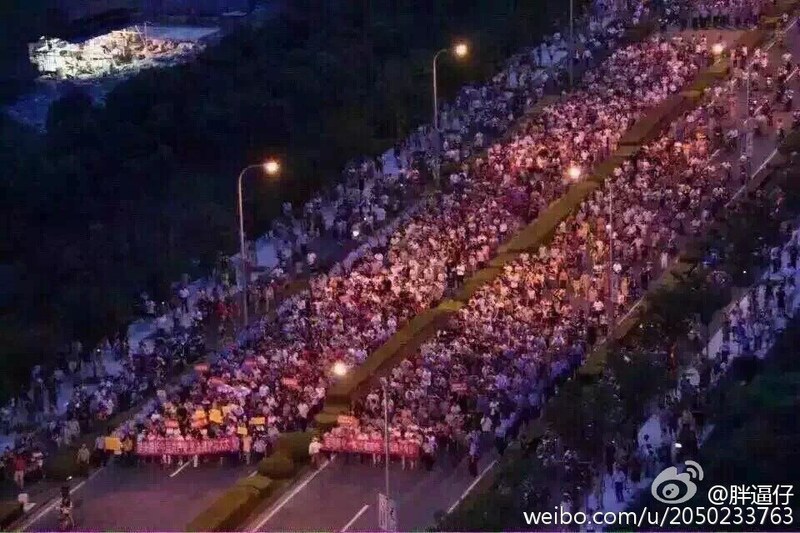 On the evening of Thursday June 25, some 5,000 people marched through Shanghai to oppose the building of a new chemical factory in the suburb of Jinshui. The protests had been going on all week and included a non-stop picket of the Jinshui District Government building. 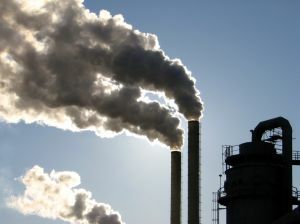 The factory in question would be manufacturing PX (paraxylene), a flammable chemical used in polyester and plastics manufacturing and a major contributor to air pollution, especially the deadly particulate PM2.5. 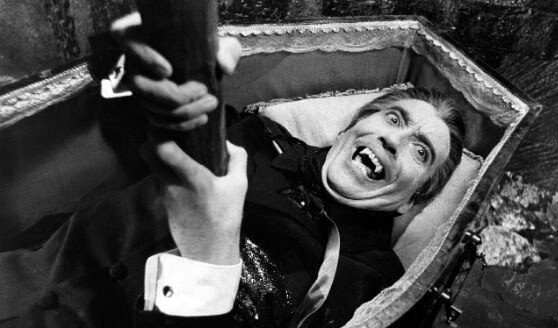 “The Earth, our home, is beginning to look more and more like an immense pile of filth. 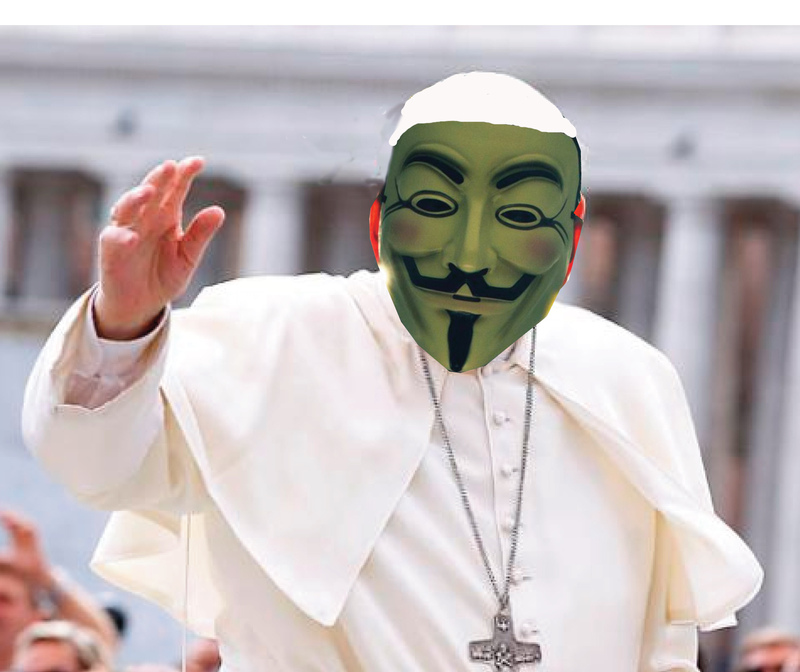 These are the views not of an anti-capitalist “extremist” but of the head of the Roman Catholic Church, Pope Francis. In a hard-hitting anti-industrial statement, worth reading in full if you can stomach the religious bits, he announces the Vatican’s policy of “integral ecology”. The church seems particularly to want to influence policies over climate change and has already invited Naomi Klein on board. 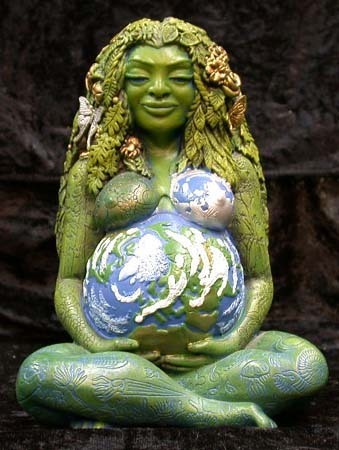 The language of the Pope’s statement is interesting – he refers to the rather pagan notion of Mother Earth, adding: “We have forgotten that we ourselves are dust of the earth; our very bodies are made up of her elements, we breathe her air and we re­ceive life and refreshment from her waters. “Nature cannot be regarded as something separate from ourselves or as a mere setting in which we live. We are part of nature, included in it and thus in constant interaction with it”. The Pope is very clear throughout that he is not only addressing his Christian flock, but “every person living on this planet”. 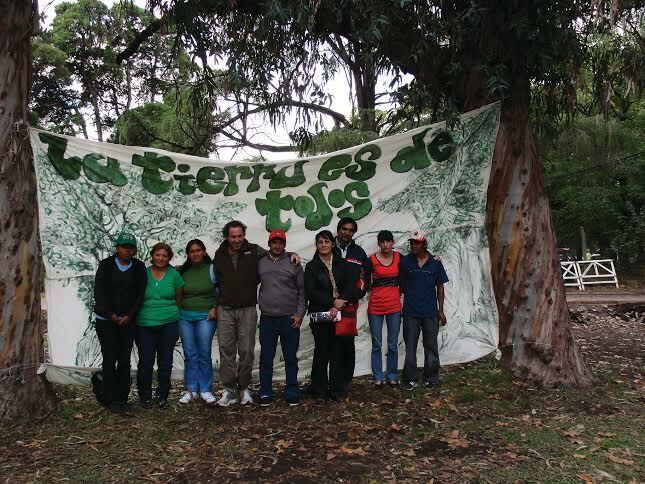 He says: “Regrettably, many efforts to seek concrete solutions to the environmental crisis have proved ineffective, not only because of powerful opposition but also because of a more general lack of interest. Obstructionist attitudes, even on the part of believers, can range from denial of the problem to indifference, nonchalant resignation or blind confidence in technical solutions. We require a new and universal solidarity”. Importantly, Pope Francis rejects the argument, much favoured by the industrial left, that technology can be used to repair the devastation it has caused. “The alliance between the economy and technology ends up sidelining anything unrelated to its immediate interests. He attacks the very notion of infinite economic “growth” at the heart of the capitalist system: “It is based on the lie that there is an infinite supply of the earth’s goods, and this leads to the planet being squeezed dry beyond every limit”. Pope Francis also brings a social dimension into the equation, saying this cannot be separated from environmental issues, and notably takes a vague swipe at the idea of private property, a bulwark of the current system. He argues: “The Christian tradition has never recognized the right to private property as absolute or inviolable, and has stressed the social purpose of all forms of private property” and adds that “the natural environment is a collective good, the patrimony of all humanity and the responsibility of everyone”. 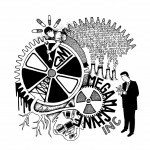 Whatever one’s opinions of the Catholic Church, its own nefarious history and its reactionary position on many other issues, it is surely a cause for encouragement when the leader of a religion boasting 1.2 billion members comes out so strongly in favour against the lie of “growth” and the whole industrial capitalist system. More to the point, why isn’t the “Left” saying all this? 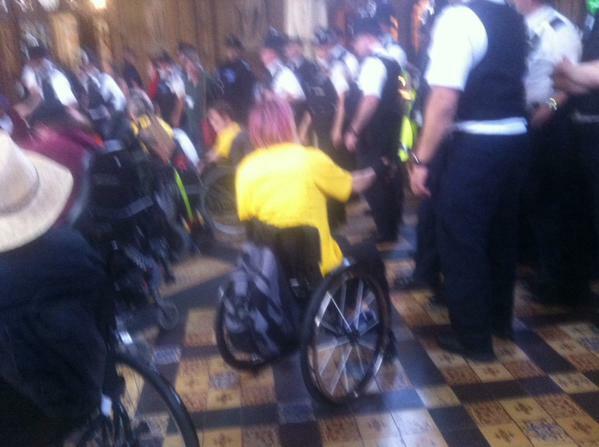 Disabled protesters put their anti-austerity comrades to shame by trying to storm the House of Commons chamber during Prime Minister’s Questions on Wednesday June 24. They were protesting against the government’s decision to end the Independent Living Fund. There are videos here and here. 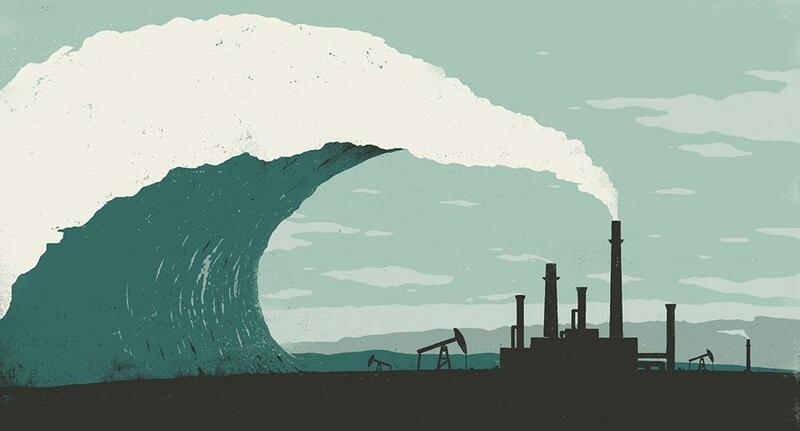 Climate vs Capitalism is the title of a free workshop being staged at the Cowley Club, 12 London Road, Brighton, on Wednesday July 15. It is being run by the Corporate Watch workers’ co-op and hosted by Sussex Anarchists. “We want to be clear that we are coming from a certain political perspective: anti-capitalist and anti-authoritarian, and that certain things will not be up for discussion. 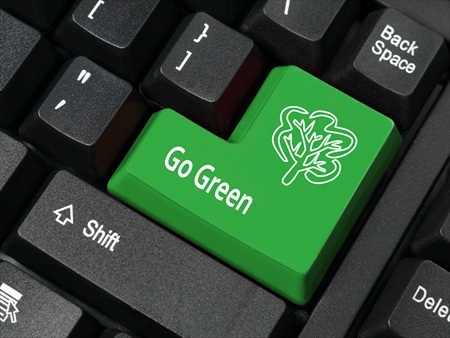 How can we avoid falling into the traps of green jobs, green growth, or green capitalism? How can we stop a radical climate movement being co-opted by those that seeking to reform rather than replace existing political and economic systems? How can we break the stranglehold of capitalist realism on our political imaginations? Capitalist realism is the idea that there is no alternative to capitalism”. All welcome. The reality behind much so-called journalism has been helpfully revealed by a bizarre TV interview with a Sunday Times journalist. In what campaign group Media Lens is calling “a laugh-out-loud, four-minute interview on CNN that should be shown to journalism students from now until the end of eternity”, alleged journalist Tom Harper tried to reply to questions about “his” scoop on how Edward Snowden’s leaked files were putting British spies at risk. The whole story had clearly been planted in the Murdoch title by the British intelligence services. At one point Harper even helpfully admitted: “We just publish what we believe to be the position of the British government”. The politics of technology are the focus of a gathering in Derbyshire, England, from July 9 to 12 2015. Breaking the Frame 2 has been organised by Corporate Watch, Luddites200 and others. Workshops will focus on the technology politics of food, the workplace, privacy/policing, gender, energy, health, militarism, mining and infrastructure. 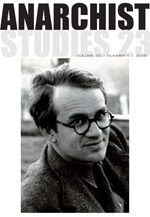 Twentieth century anarchist George Woodcock is the focus of the latest issue of Anarchist Studies magazine. Vol 23 No 1 also includes reviews of Paul Cudenec’s The Anarchist Revelation, published by Winter Oak (“well -researched and written in a lively style… highly readable and engaging”) and the excellent Managing Democracy, Managing Dissent, edited by Rebecca Fisher of Corporate Watch. Acorn quote: “In a word, we reject all legislation – privileged, licensed, official and legal – and all authority, and influence, even though they may emanate from universal suffrage, for we are convinced that it can turn only to the advantage of a dominant minority of exploiters against the interests of the vast majority in subjection to them. It is in this sense that we are really Anarchists”. Michael (Mikael) Bakunin, The Knouto-Germanic Empire and the Social Revolution.